Learn more about OFBiz merchandising features with a helpful video tutorial. We have added another OFBiz video, this time we are showing off some customizations we have done to manage products in a digital commerce store. The video shows how to manage details such as product name, price, and weight, as well as start and end dates. 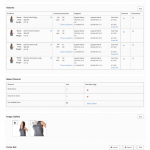 We also demonstrate how to manage product variants, images, categories, sale rules, and reviews. We are regularly adding additional videos demonstrating other enhancements and customizations made to OFBiz. Come take a look!